So nerve pain in the foot can be excruciating and the cause can often be elusive. There are 26 bones and 33 joints in the foot. Some of the bones are small and shaped like dice (the cuneiforms and cuboids located at the base of the metatarsals) and some are large and block like – the tallus and calcaneus. Ligaments are non-elastic bands which attach bones to other bones to give the foot its strength, arches, shape and functionality. Tendons attach muscle to bone and give the foot its motive power. Nerves have many functions including feeding signals to the muscles from the brain. Transmitters in the muscles (muscle spindles) and tendons (golgi tendon organs) also feed back signals to the brain from the foot. The spring of these arches when weight is applied to and removed from the foot makes walking and running more economical in terms of energy. As can be examined in a footprint, the medial (or inner) longitudinal arch curves above the ground. This arch stretches from the heel bone (or calcaneous) over the “keystone” ankle bone to the three medial metatarsals. In contrast, the lateral (outer) longitudinal arch is very low. 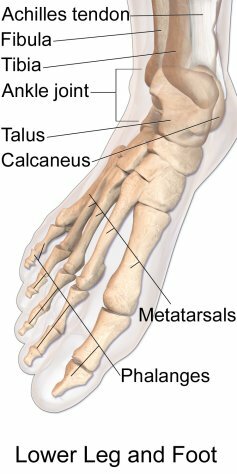 With the cuboid serving as its keystone, it redistributes part of the weight to the calcaneus and the distal end of the fifth metatarsal. The two longitudinal arches serve as pillars for the transverse arch which run obliquely across the tarsometatarsal joints. Excessive strain on the tendons and ligaments of the feet can result in fallen arches or flat feet. Some theories propose that these fallen arches may be a source of neurogenic pain in the foot. Interestingly the source of the nerve pain in the foot does not necessarily come from entrapment of a nerve in the foot. Often it is found that the source can be the hips or sacrum (tailbone). It sounds strange, right? Well what is stranger is that it can also be caused by the top bone of the neck! Here is a short video from Dr. Craig Hindson of Loving Life Chiropractic of how and why these areas of the body can have such far reaching effects which include neurogenic pain in the foot. Other articles and references for neurogenic pain in the foot can be found here.